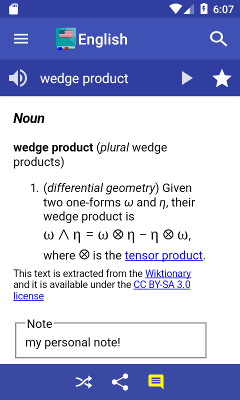 The definition of words is displayed in the main screen of the Livio Android dictionary. After you have typed a word and searched it, the application displays the definition if found. You can swipe to the left / right in order to display previous and next words. When a word definition is shown, you can bookmark it by touching the hollow star symbol on the right side (that will change to a bright yellow star) or read aloud the word by touching the speaker icon on the left side. If you have a mobile phone you can also tap in the center of the screen and get a bottom bar with few icons: shuffle icon to get a random word, share icon to share the content with installed applications and note icon to create or edit a personal note. 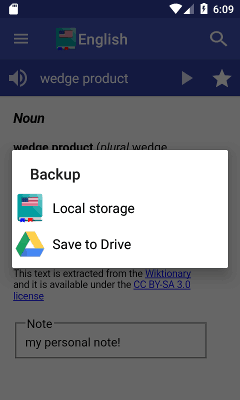 Highlighted words are useful links to other definitions inside the dictionary. Several definitions include the translations in other languages, you can jump to another dictionary by tapping the highlighted translated word. The top bar contains the search icon and main menu. By touching the search icon you get the search box and the software keyboard: here you can start to search words. You can type the symbol ? (question mark) as placeholder for unknown letters. The symbol * can be used in place of any group of letters. The fullstop symbol . can be used to mark the end of a word. 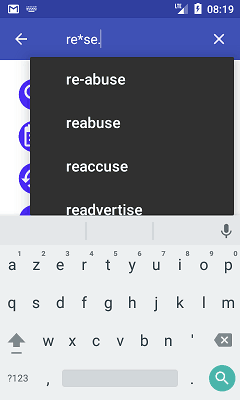 As an example, to search words starting with re and ending with se, you have to type re*se. 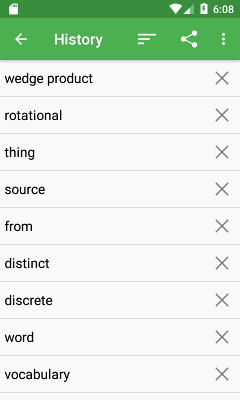 This panel contains the most recent searched words. 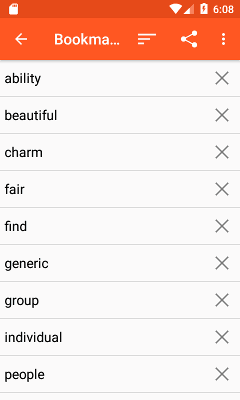 You can select one recent word, sort the list based on chronological order or alphabetical order, share the history list using installed applications or delete it. You can change the number of entries or disable it by going into the settings panel. This panel contains the bookmarked words. 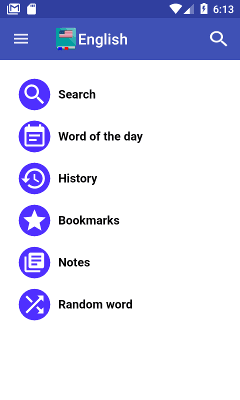 You can select one bookmarked word, sort the list based on chronological order or alphabetical order, share the bookmark list using installed applications or delete it. 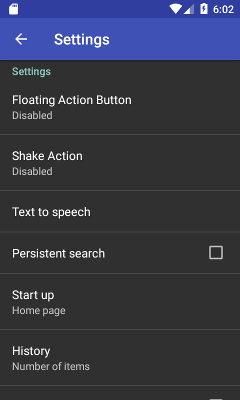 The following actions can be configued in Floating Action Button and Shake Action settings: Search, Voice Search, Camera, History, Favorites, Notes, Random, Share and Edit Note. 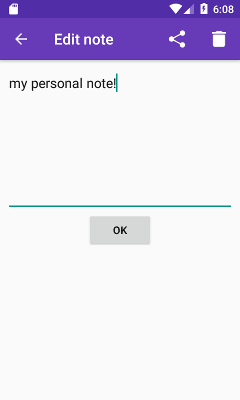 You can create your own notes for each word by using the edit note functionality. The button to make notes can be activated in the menu "Settings" by selecting "Floacting Action Button" and choosing "Edit Note". 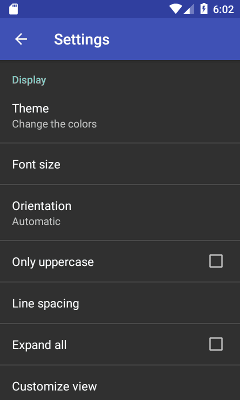 After this setting the floating action button will be displayed in the bottom right side of the screen to make/edit note. This panel, showing the conjugation of a verb, is available only for dictionary languages with complex conjugations, e.g. Italian, French, Portuguese and Spanish dictionaries. It shows all tenses for a selected verb. 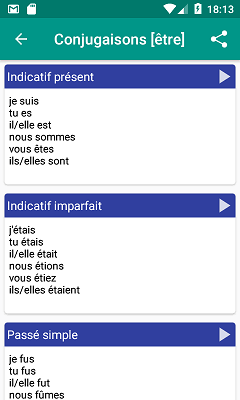 It is possible to share the verb conjugation with installed applications or read aloud the verb conjugation by pressing the speaker icon. 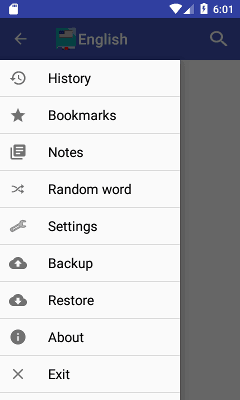 You can backup application settings, the list of Bookmarks and your personal notes. It is possible to save backup either on the local storage or on cloud environment. The following clouds are supported: Box, Dropbox and Google Drive. Note that you can use these clouds only if you have installed and configured the related applications on your device with your account. Backup and restore are performed by using the command items in the application menu.